Nobody takes an SBA loan with the intention of defaulting. Never in the history of small business did someone open their business and think “I look forward to the day when I can’t afford to make my loan payment!”. Obviously, I’m making light, as nobody would ever say something like that. But given the grim statistics that entrepreneur face, it’s prudent to understand the potential consequences of defaulting on an SBA loan. According to the Bureau of Labor and Statistics, about 20% of businesses with employees will fail in the first year. Over a 5 year span, that figure jumps to 50%. You read that right. Half of all businesses fail within 5 years. This means that if you bump into a fellow business owner on the street, one of you will not be business in 5 years. Given that the existence of your business in 5 years is a statistical coin flip, it’s imperative that entrepreneurs understand the possible downsides. As a wise man once said: hope for the best, but plan for the worst. Before I get into the 3 facts you absolutely need to know, please know that I’m not trying to dampen your enthusiasm, or talk you out of starting a business. I know how exciting it is to start a business. I’ve done many times over, and my absolute favorite part is always the beginning. All I’m saying is that if you are going to jump out of an airplane, make sure you’re doing it with your parachute packed and eyes wide open! Unless a loan is 100% secured by cash, almost every small business loan will require a personal guarantee (“PG”) from the business owner. In some cases, even key employees that are vital to the business will be asked to guarantee. 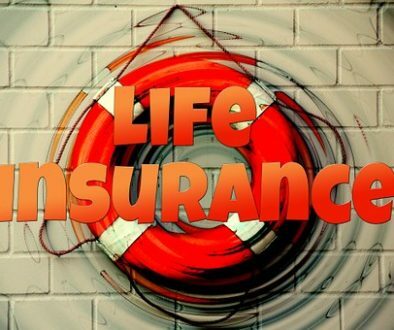 Personal guarantees are not to be taken lightly. By granting a PG, you are promising to repay the loan from personal assets if the business cannot pay. This means paying out of your own bank account, even if the business is closed. Many small business owners believe that if they form a legal entity (LLC, S-Corp, etc), this means they will be protected from personal liability when it comes to their SBA loan. If you didn’t sign a personal guarantee, this would be true. But, when you sign a personal guarantee? You are on the hook personally, even if your form a legal entity that owns the business. If you have equity in your home, it’s likely that your lender will ask you to pledge it as collateral. This gives your lender lots of control in case things don’t go as planned. If your state allows lenders to take primary residence as collateral (some don’t) and the loan is not repaid, you may face foreclosure. Even if the bank chooses not to foreclose, a bank lien will make it difficult for you to ever sell or refinance the home. The final kicker here is that if you home has equity in it, even a personal bankruptcy won’t remove the lien. Business’ closing over partner disputes is a common scenario. Disagreements between partners happen. That’s just how it goes. While partners can agree to part ways, a complete separation may be difficult. Let’s say that you and your partner decide that you are going to resign from the business. She’ll buy you out, and in exchange, she will agree that you are no longer responsible for the loan. Sounds good, right? Not so fast, my friend. While it’s perfectly fine for one party to indemnify the other (I’ve seen it in divorces too), this indemnity agreement is only between you and your partner. As far as the lender is concerned, you are both still on the hook. That means even if your partner agrees to take over the loan, you are still liable to your lender if they fail to honor that commitment. I’ve had to explain this concept a lot of the years. Inevitably, the next question that follows is: “Ok, but can I at least just pay my half”? Unless your personal guarantee specifically limits your liability to 50% of the loan balance, that’s unlikely. That’s because most personal guarantees are unlimited. You are both responsible for 100% of the loan. This means that if you can afford to repay 100% of the loan, and your partner can pay none, your lender will expect you to pay. I hope that your business flourishes for many years to come. With that said, before you take a loan for your small business, take the time to understand the downside and worst case scenarios. It’s one thing to understand and accept the risks, then make an informed decision. That’s what business is all about. It’s quite another to cross your fingers and blindly hope for the best. You wouldn’t open a restaurant without know how an oven works, and you wouldn’t marry someone without knowing them. 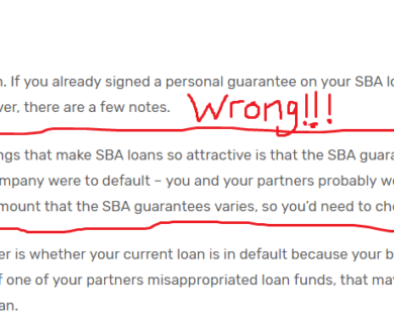 So please, don’t take an SBA loan without understanding exactly what you are signing up for! Can You Settle An SBA Loan While Business Is Open? SBA Loan Workouts: Can’t We All Just Get Along?